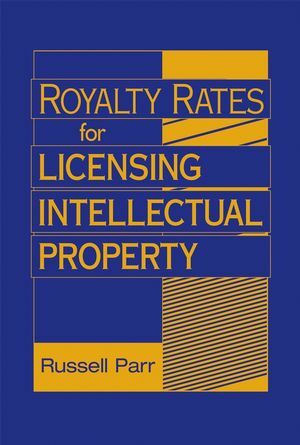 Royalty Rates for Licensing Intellectual Property includes critical information on financial theory, rules of thumb, industry guidelines, litigation based royalty rates, and tables of actual rates from real deals for different industries. Russell L. Parr, CFA, ASA is president of IPRA, Inc. (Intellectual Property Research Associates). He is a consultant, author, publisher, and lecturer focused on the valuation, pricing, and strategic management of intellectual property. For over twenty-five years, he has advised his clients about the value and pricing of patents, trademarks, copyrights, and trade secrets. His books are published in Japanese, Korean, Italian, Chinese, and Russian. Mr. Parr’s opinions are used to accomplish licensing transactions, mergers and acquisitions, transfer pricing, infringement damages litigation support, and joint venture equity splits. His clients include multinational corporations, universities, and private inventors. Past assignments have included the valuation of the Dr. Seuss copyrights and the patent portfolio of AT&T. Mr. Parr has also conducted valuations and royalty rate studies, for technology and trademarks related to pharmaceuticals, semiconductor processes and products, agricultural formulations, automotive, biotechnology, photography, chemical formulations, communications, computer software and hardware, drug delivery systems, flowers, incinerator feed systems, lasers, medical instruments, and motivational book copyrights. In addition to consulting, Mr. Parr publishes three royalty rate resource books sold all over the world. 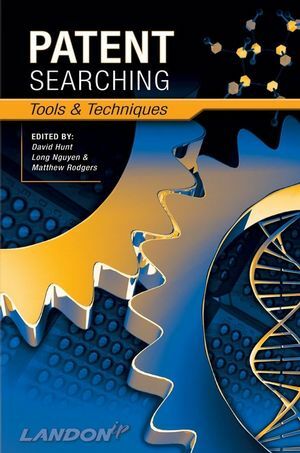 These books are Royalty Rates for Pharmaceuticals and Biotechnology, Sixth Edition; Royalty Rates for Trademarks and Copyrights, Third Edition; and Royalty Rates forTechnology, Third Edition. These books are dedicated to reporting detailed information about the financial aspects of intellectual property transactions, including licensing and joint ventures. Mr. Parr is a graduate of Rutgers University, having received a Bachelor’s in Electrical Engineering and a Masters in Business Administration. He has also been awarded the professional designations of Chartered Financial Analyst, from the CFA Institute, and Accredited Senior Appraiser, from the American Society of Appraisers. He is a member of the Licensing Executives Society and is on the advisory board of three professional publications, Licensing Economics Review, IP Litigator, and The Licensing Journal. 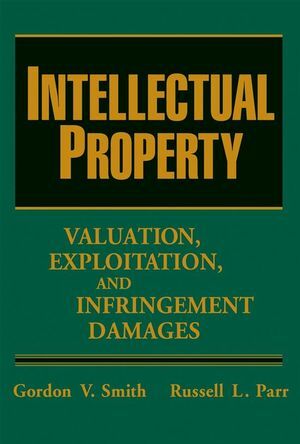 As an author and co-author, Mr. Parr has created seven books published by John Wiley and Sons, about the valuation, management, and pricing of intellectual property, including Intellectual Property:Valuation, Exploitation and Infringement Damages. In addition he has written twenty-six articles for professional publications such as Les Nouvelles and The Journal of Proprietary Rights. He has made forty-three seminar presentations for organizations including the Licensing Executives Society, the American Intellectual Property Law Association and the World Intellectual Property Organization. He has testified at deposition or trial fifty-five times regarding intellectual property infringement. More information about Mr. Parr, his firm, and its publications can be found at www.ipresearch.com. Chapter 1: Intellectual Property and Corporate Value. Who Owns the Most Patents? History of U.S. Patent Applications. Chapter 2: Licensing Intellectual Property. Reasons Companies Engage in Licensing. Chapter 3: Use of the Twenty-Five Percent Rule in Valuing IP. Empirical Test of the Rule. Royalty Rates and Licensee Profits. Royalty Rates and Successful Licensee Profits. Chapter 4: Royalty Rate Guidelines. Royalty Rates for Technology, Third Edition. Royalty Rates for Trademarks and Copyrights, Third Edition. Royalty Rates for Pharmaceuticals and Biotechnology, Sixth Edition. Internal Licenses Are Often Self-Serving. Financial Condition of Both Licensing Parties. Chapter 6: Technology Royalty Statistics. Code Division Multiple Access Technology. Wideband Code Division Multiple Access Technology. Recycling of Asphalt Roofing Debris. Chapter 7: Trademark and Copyright Royalty Statistics. Chapter 8: Profit Differentials and Royalty Rates. Driving Forces Behind Royalty Rates. Chapter 9: Investment Rates of Return and Royalty Rates. Investment Rate of Return Royalty Rates. Appropriate Return on Monetary Assets. Appropriate Return on Tangible Assets. Appropriate Return on Intangible Assets and Intellectual Property. Royalty Rate for the Specific Patented Invention. Benefits of Investment Rate of Return Analysis. Chapter 10: Discounted Cash Flow Analysis and Royalty Rates. Generic and Mature Commodity Corporate Value. New Pharmaprod Corporation Royalty Rate. Success Rate Adjusted DCF Example. Valuation Using the Relief-from-Royalty Method. Inputs for the Relief-from-Royalty Method. Remaining Life of the Patent Protection. Chapter 11: Court-Awarded Royalty Rates. Considerations Cited by the Courts in Determining a Reasonable Royalty. Federal Circuit Decisions on Royalty Rates. Chapter 12: Litigation Rates Are Higher. Comparison of Litigated and Non-Litigated Licenses. Chapter 13: Royalty Rate Services. Intellectual Property Research Associates (IPRA). Securities and Exchange Commission EDGAR Archives. 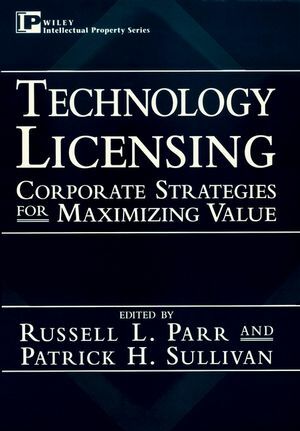 Chapter 14: Monitoring License Agreements and Financial Compliance. What Is a Royalty Audit? How Is the Royalty Audit Done? Drafting a License Agreement to Lower the Likelihood of Mistakes. Communications Between Licensor and Licensee. Conclusion: Benefits of a Sound Monitoring Program.